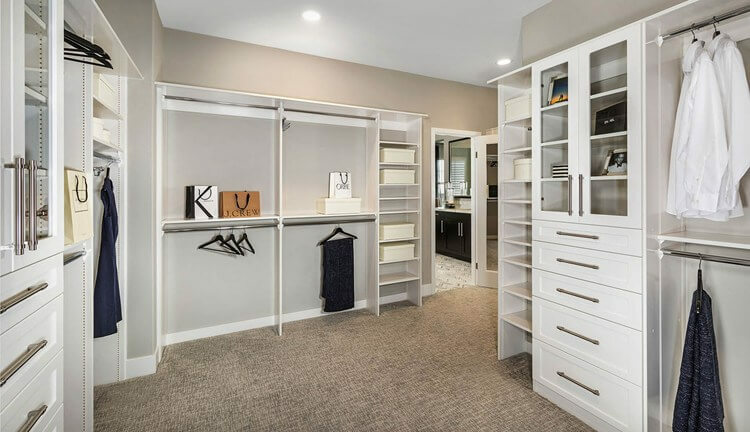 When designing your home, think about how you can create your closet wonderland, like this master closet from TriPointe Homes (Residence Two at Bradford, Azusa, CA). We all want more closet space. As you think about designing your new home, it’s time to get creative in putting together the closet of your dreams. With a little organization and some helpful accessories, your closet can become a wardrobe wonderland instead of a disaster zone. First off, take a good look at your existing closet space and what’s in it. Say goodbye to anything you haven’t worn in a year. Move non-clothing items elsewhere to make room for clothing and shoes. Maximize space by rotating your clothes seasonally. In winter, move flip-flops and shorts to plastic storage bins or boxes in the garage. In summer, do the opposite with winter stuff like coats and snow boots. This way you’ll always have the most useful items nearby. Plenty of closet accessories are available to help you make sure your shoes don’t end up in a heap on the floor and your clothes don’t attack you when you open the door. Doubling your closet space is as easy as adding a second rod to your closet. There are many that require no installation—just drape over the existing rod and boom! Extra space. Don’t waste individual hangers for tank tops. Store them on one hanger using shower curtain rings and just one hanger. This works great for spaghetti strap sundresses, too. A vertical multi-row hanger is a great space-saver for slacks and dress pants. Installing a few tension rods in your closet creates instant shelving for shoes. Storing them off the floor keeps them organized and in better shape for longer. Those fashionable heels deserve some good-looking storage. A simple metal grid can rest against a closet or bedroom wall to show off (and protect) your Carrie Bradshaw-inspired spikes. To curb clutter, install hooks on your closet door or wall to hang hats, scarves, purses, belts and other accessories. Hooks are a great—and inexpensive—way to showcase your personality. They can be as fancy and creative, or as simple as you want them to be. You can just purchase some simple ones at your nearest hardware store. You’d be amazed at how much space you can save when your tall boots are not flopping over. Hang boots using hangers with adjustable clips. Or, to keep boots upright on the shelf, stick an empty plastic water bottle or a cut pool noodle into the bootleg. With this arsenal of space-saving tips at hand, you can organize your wardrobe into the closet of your dreams.